I define a new class in namespace A. Then i want to use this class in namespace b. I didn't add a using for namespace A in my source. When i start to type the classname intellisense pops up and makes suggestions. 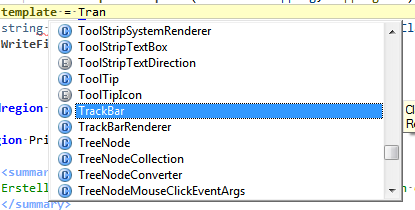 Because i didn't imported namespace A until now, my newly defined class is not in the suggestion list. When i press space after entering the complete classname i expect that the "Add Using" fix will be displayed. Instead my class was replaced by the entry from the suggestion list which was higkighted at the time i completed to entry the class name. When i close the suggestion popup manually via escape before finisch entering my classname, the "Add Using" fix will be displayed. I hope you will fix this behavior before the release build, it's absolute annoying. it's a pity that the behavior is by design. I try to remember that i should use ESC to close the popup, but most time i forget it. I hope you will redesign the popup behavior as soon as possible. Unfortunately it's out of 6.0 scope. We really have to think over various use cases for different technologies. Thanks for understanding. Am I right that the source of your problem in automatic item completion on typing space? you are right. Am i right that you try to correct typing errors with this behavior? You deserve credits for trying this, but in my opinion it is not necessary. My preferred way to fix this would be to complete only automatically if all characters i typed are part of the item. The popup should disappear when i type the first character which is not part of any item in the list. In this example screenshot the popup should disappear when i type the "n" . When i type a declaration R# should also check if i'm typing the name of a class which is contained in a namespace i haven't included (as it do now only if i press ESC to close the popup). Is it possible to make a workaround by adding an option which restricts automatic item completion by typing TAB? If i remember this was the behavior in R# 5.x.